Rumor has it we’re going to finish The Move this weekend. First thing’s first: I worked almost 15 hours yesterday. And by “almost 15” I mean 14.75. I know, I know. Not exactly bragging rights. People work almost 15 hours a day all the time, right? Wednesday night, I was in the newsroom until midnight. Last night, I was there until 2 a.m. And was back at 10 this morning. All in all, a 51-hour work week. I don’t know where I’m going with this. I think I just want something to excuse my pure and utter EXHAUSTION and reluctance to do anything related to The Move. There are about 10 shirts piled on the desk right now that I could, theoretically, hang up to prepare for The Move (to move clothes, we’re simply leaving them on the hangars/in the drawers and throwing them in the car… we’re that awesome) butttttttttt… no. However, my Mountain Dew’s gone and I don’t hesitate for a second to jump (literally) out of my chair to grab another. IN OTHER NEWS (I’m trying to see how many consecutive posts I can use that phrase in), I baby puppysat Wednesday night. 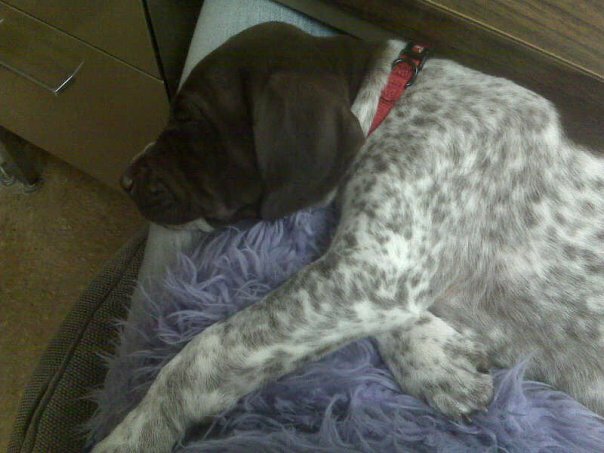 She’s a German shorthair, six (maybe seven?) weeks old and FRICKIN ADORABLE. I plan on stealing her sometime in the near future. I took her to work with me Wednesday night so she wouldn't have to be alone. She curled up with that purple pillow and slept almost the whole night... on my desk. omg I want that dog! I LOVE reading your site. I’ve officially added it to my blogroll. Great writing! Puppies on desks? Cutest thing EVER! 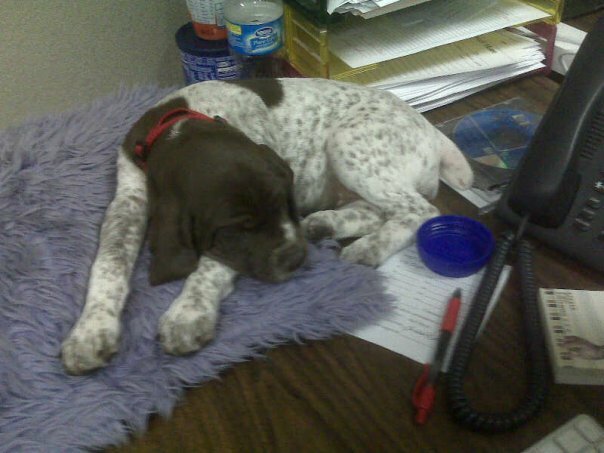 😉 When I got Lila and Rusty they came to work with me the first two weeks and slept in their basket on my desk. Puppysitting is way better than baby sitting.